At first I kept telling him that he needed to get one of his books, but I finally gave in and we read it together. And I must say, it was quite fun! We flipped through and on quite a few pages we saw a picture of a car or truck or tires or something similar. I had no idea that there were so many auto-related things in the Yellow Pages. Quite a lucrative industry. So, next time you're looking for a good read, go for the yellow! How awesome that he chose the yellow pages. I would have been reluctant too but part of emergent curriculum is following the child's interest and lead. Way to go mom! That's cute. We traveled a ton. 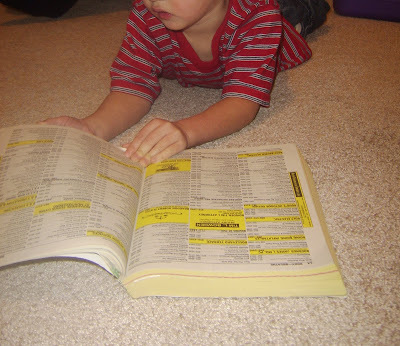 One of the first things my kids would do when we got into a new hotel room was to go through the tourist info and the yellow pages to see what there was to do in the area. It was kinda fun reading it together.